The Londoners claimed a 1-0 victory over Perth Glory in front of 60,000 fans. 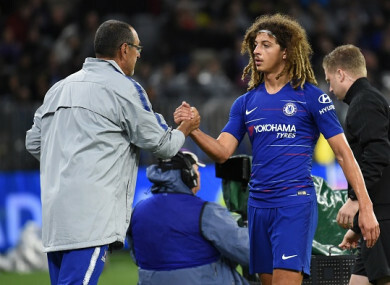 Sarri shakes Ethan Ampadu's hand after the final whistle. MAURIZIO SARRI MADE a winning start as the new manager of Chelsea by defeating Perth Glory 1-0 in a friendly today. The Italian, who replaced countryman Antonio Conte earlier this month, was without his team’s World Cup stars in front of a sell-out crowd of 60,000 at the new Perth Stadium. The Blues were still far too good for the home side — themselves playing their first game under new manager Tony Popovic — just weeks out from their Premier League season opener on August 11 against Huddersfield. The Blues asserted their dominance early when Pedro scored in the fifth minute, and totally dominated the match for the most part, likely leaving Sarri wondering how they did not find the back of the net many more times. With both sides in different stages of their pre-season preparations, Glory were under siege for long periods of the game and Chelsea threatened most times they took possession. At one stage, the London club hit the upright three times in 10 minutes in the second half. Perth goalkeeper Liam Reddy was the busiest man on the field for much of the night, making some fine saves and watching hopefully as other Chelsea shots sailed just wide of his goal. Slippery conditions due to heavy rain before and during the match did not help either side. Chelsea’s last touch was just slightly lacking, while Glory played their best football when the tempo slowed noticeably in the last 15 minutes. Sarri would have been delighted with the brilliance of youngster Callum Hudson-Odoi in the first half, with the 17-year-old setting up the only goal of the match. The teenager’s pace and skill was on display as he broke down the wing and produced a superb left-foot cross for Pedro, who slotted it inside the far post with a crisp volley that proved to be the winner. High-profile new signing Jorginho was also impressive in the midfield in the first half, a promising start to his time with the Blues, while Cesc Fabregas dominated throughout. The former Napoli midfielder only signed with Chelsea last week after negotiations lengthened by the departure of Conte, choosing the London side over Manchester City. Both sides made a swag of changes in the second half, and Glory showed great spirit to rally in the dying minutes, producing some late chances much to the chagrin of Sarri. The FA Cup Chelsea won earlier this year was on display for the club’s first game in Perth since 1974, and third overall. Email “Pedro volley ensures Sarri era at Chelsea gets off to a winning start ”. Feedback on “Pedro volley ensures Sarri era at Chelsea gets off to a winning start ”.